This page contains a Beginner's Guide to Kingdom Hearts 3 (KH3,) including the game's basic gameplay mechanics, battle system, Moogle Shop, and new features to the series. Everything you need to know when first starting Kingdom Hearts 3, including new and returning game features, game menus, combat system and controls, exploring various worlds, the Moogle Shop and mini games. Read on to know the game’s basic mechanics to start your adventure across the various worlds. The Kingdom Hearts series is known for adopting action role-playing gameplay. It follows the protagonist Sora’s adventures across various worlds inhabited by characters from the Disney and Final Fantasy franchises. Sora is typically aided by his friends Donald and Goofy who fight alongside him in battle. Players are only able to actively control Sora but are able to customize the equipment and abilities of his allies. For the first time in the series, Kingdom Hearts 3 will allow up to five characters in Sora’s party at a time. 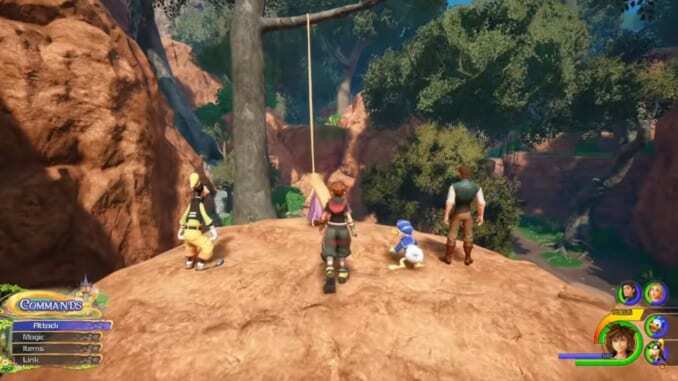 Sora, Donald, and Goofy can be joined by up to two characters from the world they are exploring. Kingdom Hearts 3 features a cast of unique characters with interesting histories throughout its deep narrative. Read more about them in our Character List. The party menu allows the player to access a variety of features. These range from viewing the current status of the party to customizing each member’s equipment, skills, or abilities. The Party Menu also displays the player’s current location in the world they are in, as well as how much Munny they have. Here, you can change your current equipped weapons, armor, accessories, and items. Players can equip Sora and his allies with with Keyblades, Shields, Staves, Armor, Accessories, and an Item. Note that it is important to know the best Keyblades and best Armor pieces in the game. Read more on equipment in our Equipment Guide and Directory Page. Allows the player to equip different abilities using Ability Points (AP.) Abilities can either be activated manually by the player (Active) or automatically take effect (Passive). 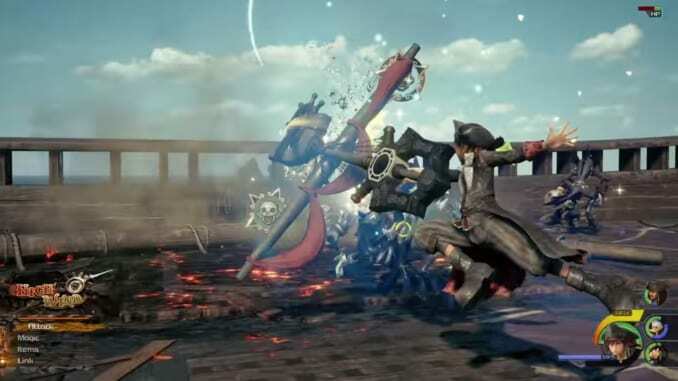 You can view all of Kingdom Hearts 3 character abilities in our Abilities List. Opens the menu to prepare Cuisine with Remy using ingredients the player has gathered. 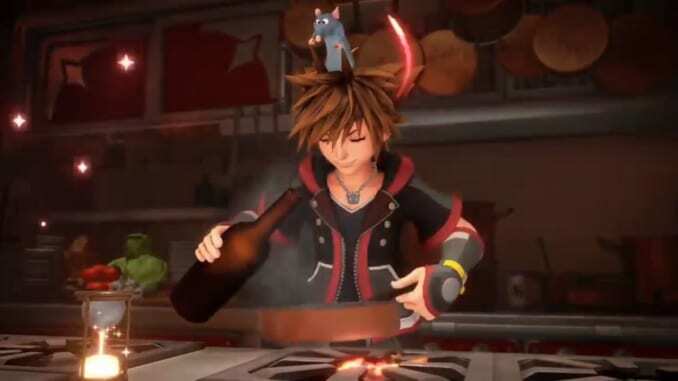 Cuisines are rated according to their quality and will grant Sora various buffs after eating them. Read more about this new feature in our Cuisine Mini Game Guide. The list of items the player has in the inventory. 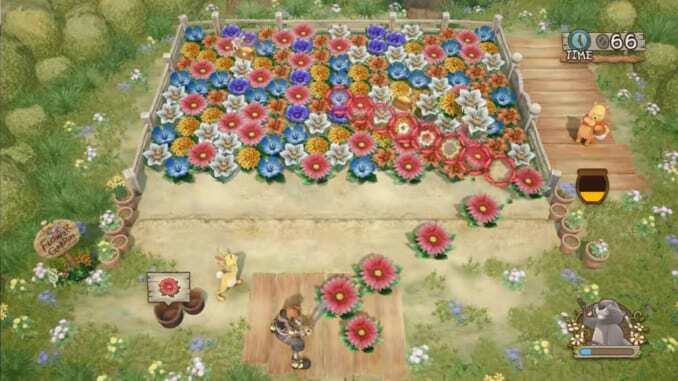 Items can be bought at the Moogle Shop, obtained in Treasure Chests, or synthesized using materials the player has gathered. Opens the party command customization menu to tweak shortcuts and AI behavior. Allows the player to view the stats of each member of Sora’s party. 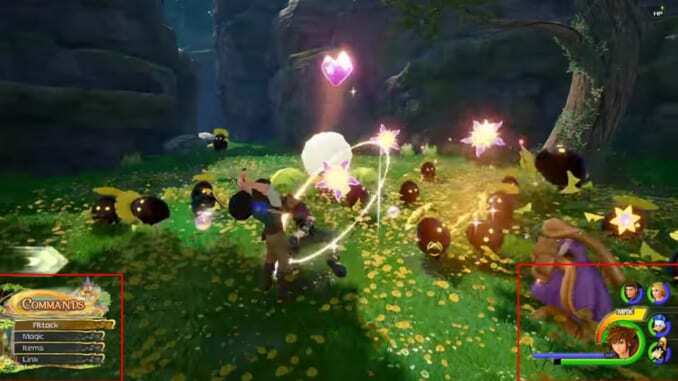 This includes current buffs and debuffs/status ailments such regen, stop, poison, etc..
A new feature in Kingdom Hearts 3 which logs Sora’s adventure, replacing Jiminy’s Journal from the previous games. 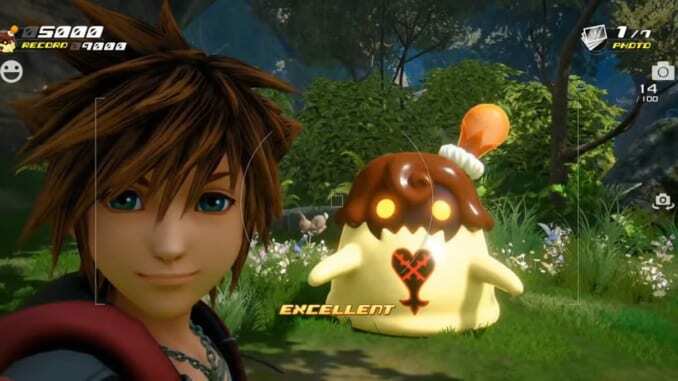 The Gummiphone also allows Sora to take photos of his adventure. It also lists a number of Game Records that Sora can complete. You can view all objectives for this feature in our Gummiphone Photo Missions Guide. Contains basic information on various mechanics and features of the game. Allows the player to tweak the game’s settings to his or her liking. 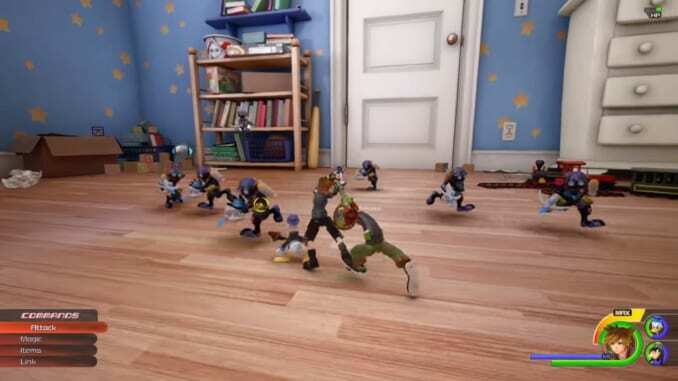 Sora and his friends will frequently encounter a host of different enemies in Kingdom Hearts 3, each with their own unique attacks and characteristics. 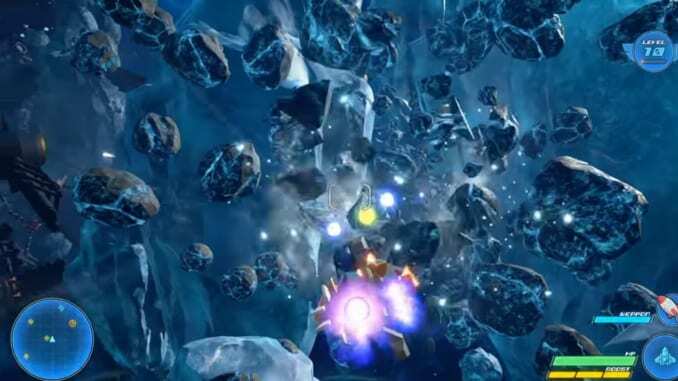 Players will need to familiarize themselves with the game’s combat system to defeat the enemies and bosses they meet along the way. You can read tips for fighting enemies in the game in our Tips for Battle article. The Battle Commands Menu is displayed on the bottom left corner of the screen and allows players to select from four commands and menus: Attack, Magic, Items, and Link. Press either up or down on the directional padto navigate through these commands. The player can check Sora and his party’s status on the bottom right corner of the screen. This section indicates each character’s current HP and MP. A character will be knocked-out if his or her HP hits 0. The battle will continue until Sora himself is knocked-out. A gauge unique to Sora is the Focus Gauge. This allows Sora to lock-on to multiple enemies and perform a devastating attack called Shotlock. The more focus Sora has, the more time he will have to lock-on to multiple targets for higher returns. The Focus Gauge refills by attacking enemies. Players can lock on to specific enemies, allowing them to easily track and observe enemies when fighting. Pressing the R1 or RB button locks Sora on to a foe, the camera focusing on it. Targets can be switched by pressing the L2 or LT button. Performs attacks using the currently equipped Keyblade. Attacks vary depending on the unique properties of the weapon used. Use attack multiple times in succession to perform a combo. Certain abilities allow Sora to perform extended combos, launch his enemies into the air, or even perform counterattacks. Intercepting an enemy’s attack with your own attack will cancel both. Pressing the Square or B button will cause the player to perform a Dodge Roll. Sora invulnerable to enemy attacks for a brief period while rolling. The distance rolled increases as Sora levels up. Dodging is an essential part of combat and can be used to get out of harms way or to safely close the gap between you and an enemy. Casts magic spells to either damage, heal, or buff the player or the entire party. Using magic will consume Sora’s MP depending on the mana cost of the spell cast. You can view a list of all Magic spells and where to obtain them here. Uses items from the player’s inventory to recover HP, MP, or cure Sora or his allies of any status ailments they might currently have. Allows the player to perform a Link, this game’s take on summoning creatures. Links have different abilities and can help the party either offensively or defensively. The player will obtain various Links over the course of the game, usually after completing the main story specific to the character’s world. A full list of Link Summons can be viewed in our Link Summons List. 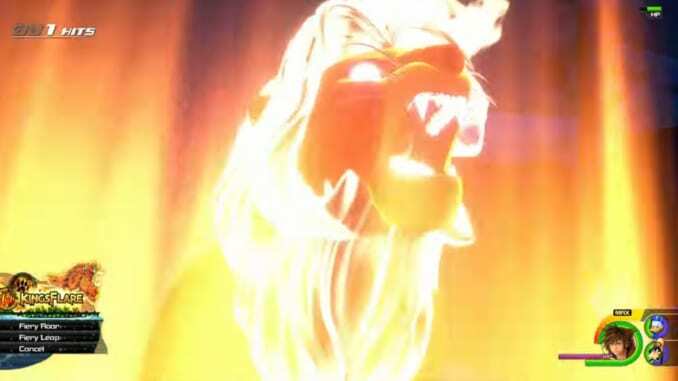 Sora can perform Reaction Commands against certain enemies, usually against bosses. Reaction Commands allow Sora to dodge or counter enemy attacks, or use other unique abilities during battle. A Reaction Command becomes usable for a brief moment when the Reaction icon appears. Press the triangle or Y button to perform them when available. Certain worlds have unique methods of travel. The Kingdom of Corona, where Rapunzel is located, allows Sora to use Rapunzel’s hair to swing from tree to tree. San Fransokyo allows Sora and his friends to surf the rails of train tracks above the city. A full list of explorable worlds can be viewed in our Worlds List. The worlds are inhabited by various characters, ranging from typical NPCs to major characters. You can talk to them by pressing the action button. Sora can also interact with objects such as chests, machinery, and Save Points using the action button. The Gummiship is an airship that Sora and his friends use to travel between different worlds. Collecting various parts and materials allows the player to upgrade the Gummiship to increase its armor, weapons, and more. Scattered across the worlds are Moogle Shops. Players can buy and sell equipment here, as well as access the Workshop to synthesize items, forge Keyblades, or check current Photo Missions and Collector’s Goals. The Moogle Shop sells a number of weapons, armor, and items. Players can also sell unwanted equipment here for extra Munny. The workshop allows the player to synthesize various equipment and items. Select Synthesize to create items depending on the availability of materials on hand. Players can forge Keyblades in the Moogle Shop if they manage to gather the required materials. Of course, more powerful Keyblades will require rarer materials. Photo Missions are specific sub-missions that require the player to use the Gummiphone to take pictures of various subjects or events. Akin to a scavenger hunt, the Collector’s Goals list various objectives requiring the player to gather certain items. Displays a compendium of materials gathered. Kingdom Hearts 3 boasts a variety of fun mini-games, as with the previous titles in the franchise. Mini Games are usually unlocked after going through them as part of the main story. Certain Mini Games reward players if they achieve high scores as well. You can view all available mini games in our Mini Games List.